As 2011 concludes, NGO Monitor www.ngo-monitor.org released a list (below) of the most outrageous and absurd NGO actions from the past year, demonstrating the political nature of NGOs involved in the Arab-Israeli conflict. NGO Monitor also published an op-ed in the Jerusalem Post on the NGOs' lack of preparedness in 2011 during the Arab Springs. Another op-ed appeared in JTA as a letter to Tom Friedman and Hillary Clinton, facetiously discussing the state of American democracy. 1. Amnesty International's new Israel Researcher, Deborah Hyams, has a history of radical anti-Israel activism. 2. HRW's Sarah Leah Whitson race-baited American Jews and ignored the embarrassment of having praised Saif-Islam Qaddafi as a human rights reformer. 3. German NGO "Remembrance, Responsibility, and Future (EVZ)" exploited government funding designated for Holocaust reparations and education in order to join the delegitimization campaign against Israel and added to new antisemitism. 4. Palestinian Center for Human Rights (PCHR) condemned as "war crimes" the IDF response to the terror attack in Eilat. 5. A number of NGOs attacked Judge Richard Goldstone after he honestly admitted the need to "reconsider" his UN report. 6. HRW appointed Shawan Jabarin to its Middle East Advisory Board, an alleged senior activist in the PFLP terrorist organization, and head of Al-Haq. 7. Members of Machsom Watch supported and hugged relatives of the murderers of the Fogel family killers. 8. Amnesty International defended Ittijah head Ameer Makhoul, a convicted Hezbollah spy. 9. Coalition of Women for Peace (CWP) accused the New Israel Fund (NIF) of being an "ally" of NGO Monitor, after NIF was forced to finally end funding to the pro-BDS group. 10. Wikileaks revealed that NIF Associate Director in Israel Hedva Radanovitz believed that "the disappearance of a Jewish state would not be the tragedy that Israelis fear since it would become more democratic." 11. Itamar Shapira of Breaking the Silence claimed "we are creating the terror against us, basically." A team of seven Israeli volunteers including three doctors and one nurse visited Nepal for a 13-day stay in April 2011. A team of seven Israeli volunteers including three doctors and one nurse visited Nepal for a 13-day stay in April 2011. The formal opening of the program "Vision Nepal 2011" took place at Dhulikhel Hospital, the Kathmandu University Hospital, on April 22, inaugurated by the Vice President of Nepal, Mr. Parmananda Jha. The next day a symposium on cataract and oculoplasty was held at Dhulikhel Hospital in coordination with Embassy of Israel, Eye with Zion and the Nepal Ophthalmic Society. Some 60 participants including ophthalmologists, residents and optometrists from all over Nepal participated in this symposium. A three-day camp at Mane Kharka, in Langtang Valley, was set up along with a team of medical doctors from Dhulikhel Hospital on April 24, where the Israeli and Nepali doctors together conducted examinations, treatments and surgeries. A total of 485 cases were examined during the camp, among which 54 cases of cataract were identified. Of these, 25 patients were operated on during the camp, and the rest were referred for treatment to Dhulikhel Hospital. After returning to Kathmandu, the Israeli doctors continued to conduct treatments and cataract surgeries at Dhulikhel Hospital and wrapped up their mission on May 3, 2011. On November 2nd The PA ministry issued a decision decreasing the transfer of seriously ill patients to Israel, citing the high cost of treatment in Israeli hospitals. The 18th Holiday of Holidays Festival multicultural event marks Hannukah, Eid Al-Adha and Christmas in interfaith harmony. It's a happening that brings tens of thousands of happy people to the streets of Haifa every December. Now in its 18th year, the Holiday of Holidays Festival is once again filling the Jewish-Arab mixed Wadi Nisnas neighborhood with good cheer, musical concerts, art exhibits, delicious bites and, most importantly, a feeling of togetherness. It's actually a combination of holidays of the three main monotheistic religions: Hannukah, Eid Al-Adha and Christmas celebrated in interfaith harmony every Thursday through Saturday in December. "We honor everyone who lives here," says Asaf Ron, CEO of the Beit Hagefen Arab Jewish Center, which organizes the event. "The festival is very important for dialogue, community activity, neighborliness and tolerance." On the bill are an antiques fair, outdoor art exhibits, crafts fair, Christmas tree decorating, Christmas parades, liturgical concerts, neighborhood tours, concerts, street theater and Israeli street food. "First of all, visitors must see the art exhibits. This year the artists look at their origins. The art is at the heart of the festival," says Ron. "Secondly, the [concert] stages are a center point and a real Israel mix. You can hear everything on the stage: Baha'i music, modern Arabic music, world music, Israeli music. This is a happening for everyone. It's great to see all the religions in the same festival." Travelers tend to go to Haifa to see the Baha'i Gardens, Stella Maris Monastery, the Cave of Prophet Elijah, the Achmadim Mosque and the Old German Colony area. The city does not boast a particular pilgrimage site as found in Jerusalem or Nazareth. "Haifa offers something else. We're not a holy site specifically, but we have people that want to live harmoniously; the atmosphere here is special. The feeling is one of pluralism," Ron says. The annual festival attracts some 200,000 people from across Israel and even from abroad. More than 40 percent of festivalgoers are out-of-towners. "The festival is very important for dialogue and a shared experience of togetherness," Ron says, noting that Beit Hagefen’s goal is to educate toward coexistence by means of cultural and artistic activities. The festival takes place in the neighborhood of Wadi Nisnas, where Jews, Christians and Muslims live side by side. A few churches are located here, but the area is best known for its art and culinary delicacies. Here you’ll find some 100 works of art by Arab and Jewish artists from across the country. And the marketplace (shuk) is known for its mounds of indigenous herbs and oriental pastries. During the year Wadi Nisnas is a quaint neighborhood with an open-minded atmosphere. 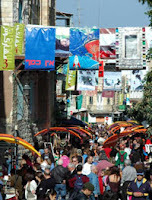 During the festival, it's one of the most energetic and boisterous places in Haifa, if not in all of northern Israel. One of the best-loved activities is taking a photo with Haifa's own Santa Claus. "At least 80 percent of those taking pictures with Santa are Jewish," reports Ron. "It's an attraction for everyone." Another highlight is the coexistence walks. Beit Hagefen conducts these guided tours year-round at NIS 20 per person, but it is at the festival that demand really heats up. The tours are conducted in Hebrew, Arabic, English, Spanish and Russian. Ron says they're working on getting French-speaking guides as well. The Art Works route includes displays by dozens of Jewish and Arab artists; the Poetry Path includes excerpts by Arab and Jewish poets and explains how their words connect to the neighborhoods; the Taste of Wadi Nisnas route includes samplings of traditional foods like knafeh, baklava and olesh (chicory); and the German Colony route gives a short history of the Templar settlement amid the beautiful historic buildings. While informative, Ron says, the purpose of the tours is to introduce visitors to the cultural mosaic of Haifa. "Educational messages of peace, pluralism, tolerance, cooperation, neighborliness and joint hope for a better future, are conveyed through the tours," reads the Beit Hagefen website. And then there's the Christmas parade. Ron says December 22-24, 2011 is "the" weekend to be in Haifa. "Hannukah and Christmas get their start with the Santa parade that winds around the neighborhoods. The parade ends with the lighting of a hannukiah (menorah) and with two Israeli-Jewish and Israeli-Arab bands playing on stage." There really is a little something for everyone. Having been invited to participate in the "BIG TENT for Israel" event in Manchester UK, recently, I wanted to express some thoughts after returning home. One of the people there I got to know was Ray Cook who wrote up his impressions, so I ask myself, why reinvent the wheel? An Israel first…Muslim students from the Galilee village of Ein Mahal joined their "Friends Forever" Leo Baeck partners to present their unique and life-changing story of shared existence to schools in India and the US via a historic Tony Blair Face to Faith multi-country Video Conference. This special day celebrating the deepening relationship between the village of Ein Mahal and the Leo Baeck community and our capacity in Israel to bridge the gaps that divide our cultures, marked the launching pad for Leo Baeck's Human Rights Month. The Friends Forever Program is the inspiration for “Step By Step Sauwa Sauwa”, an original Arab-Jewish musical production featuring 38 talented Muslim and Jewish students to be performed in London on 22nd and 24th April 2012.